It’s always exciting when a new President of the United States is on the horizon! 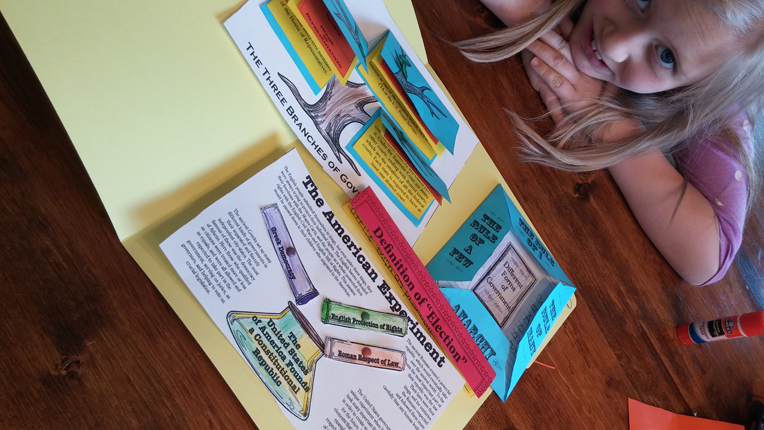 We have been blessed to review HISTORY Through the Ages Hands-on History Lap-Pak: U.S. 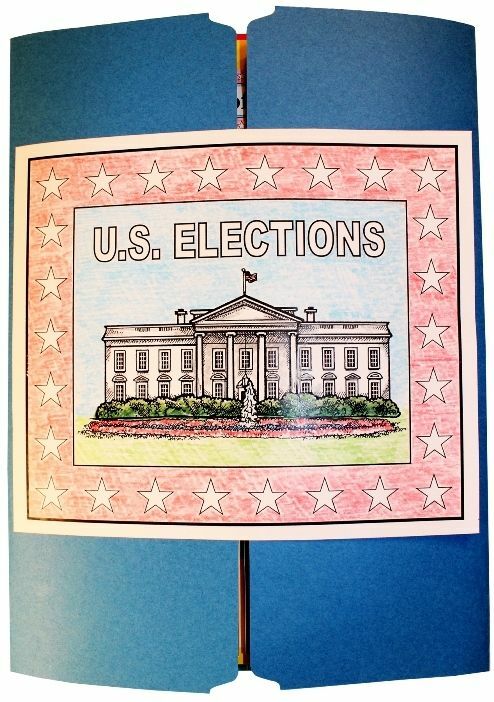 Elections by one of our favorite homeschooling companies, Homeschool in the Woods! The U.S. Elections and how our President is chosen isn’t an easy process to understand. We were so surprised at what we retained in this study! The projects lay out a visual order that is easily brought to mind when you complete them. My children simply picked up the steps from doing each project. In the end, they have a picture show of these steps to recall how the process works. We completed and LOVED this study. We had fun and felt we were able to retain much more than just reading. The projects were the highlight for my children, but much more is included. The included audio corresponds with the reading text. You have a few options for printing either a booklet or full binder size text. There is a book list, and a GREAT list of website resources. I have to be honest and say if I knew how to search for these websites using election vocabulary before, it would have helped us so much! But until we did the study, U.S. Elections were quite a mystery for us, along with the vocabulary. So, if you are anything like us, get the study. Click the image for a quick 3 minute screencast of the inside elements to this awesome U.S. Elections lapbook! Once you download, click the ‘start.htm’. This is your homepage to the entire Hands-on History Lap-Pak. Go to the introduction/resources etc. 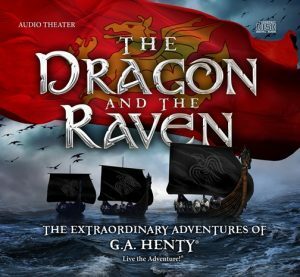 There is a book list and website list (which is excellent! ), to guide you into extra learning. You may want to visit the library and have some of the books on hand to enhance your learning. You will also find all the supplies you will need for the entire project. I tried to find what I had on hand so I wouldn’t have to buy a lot of extras. Notes: We substituted the Dura-Lar, and laminated some glitter instead :). Double-sided tape also worked best for any ‘gluing’ of paper and went through 4 rolls of it (5 children). Opt for sturdy colored paper! The project instructions completely walk you through printing and assembly. We chose to complete 2-3 projects per session. Right after the lesson, I would print the next day’s projects so we were ready to go. This has been an exciting 3 weeks! Each project has different levels of difficulty in skill. 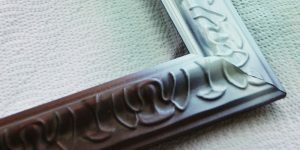 Some are fairly simple with just cutting and coloring, others require exacto knife cutting or complex assembly. I used the U.S. Elections for ages 8-16. Yes! 16! He really liked all the information, especially the websites on how to keep track of the latest election happenings. Copywork or pre-printed text is available for each project, so there is no worry if your child isn’t up to the copying level yet. The very last project – Vocabinet – is excellent review.The vocabulary can be learned by all! My children jumped ahead and ended up mixing up their cabinets and definitions. I took the opportunity to make them work through finding each. Overall, this was the best experience in lapbook learning we’ve had so far. 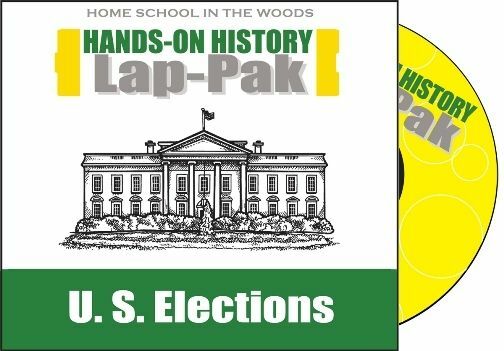 I highly recommend Hands-on History Lap-Pak: U.S. Elections! While you’re at it, take a look at all the other studies Home School in the Woods offers. We’ve used several, and it’s the best hands-on learning we’ve found! 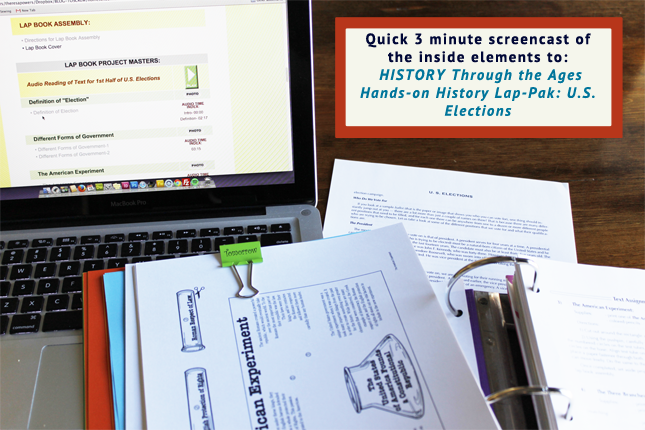 Historical information is looming behind that election door…get your study today!